Looking for a digital camera but not sure where to go? Want something with a little more resolution and power than just a point and shoot? Interested in starting photography as a hobby? 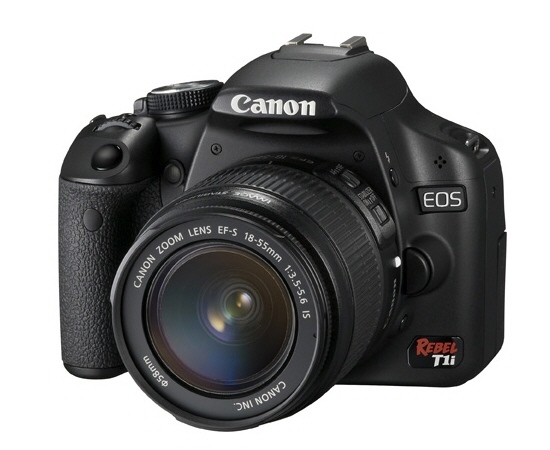 Then look no further than the Canon Rebel T1i. The Rebel has long been Canon’s inexpensive yet elegant choice for digital SLRs. And this camera is no exception, and continues to keep the name of Canon up there in photography gold. Every now and then, a lightweight camera is something that you need, at other times, it is not what you are looking for. The Canon Rebel T1i has this light weight and balanced feel to it as you carry it around your neck seeking a new masterpiece with every click of the lens. With rubber contoured grips in the front and a grip for the thumb on the back, the camera can easily be taken in hand and easy to handle securely. With lighter or heavier lenses, we come across an issue of potentially having a harder time balancing the camera in hand, and the assistance of the Image Stabilization comes into play with the different lenses to choose from. With so many different functions, the Canon Rebel T1i contains more than your fair share of things to fool around with the get the perfect picture. This can be a bit intimidating for the first time user, and I agree that I even have a hard time with mine and I’ve had it for just over a year! But for those who are truly dedicated to the camera, you are able to produce semi-professional quality photographs without the thousands of dollars spent on expensive camera bodies and equipment. From everything from adjusting the exposure to Image Stabilization and everything in between, the functions can be daunting at times, but allow for truly quality images. You need to buy this camera if you are even considering it. If you are looking to get a Digital SLR or replace an existing one to keep up to date with the times, the Canon Rebel T1i is the perfect fit for your function. With a reasonable price, different unctions, video capability, and changeable lenses, this camera truly out-performs any of its weaknesses.